Freeze your own unique character pops fast with the Zoku Character Kit. Create animals, faces, and fun characters of your own design, or follow Zoku’s designs included in the instruction booklet. The creative possibilities are endless! The kit includes 14 stencils, 1 faceplate, 1 stand for holding the pop maker steady, a pusher tool for removing fruit slices from the stencils, instructions, and sample character designs to get started. The 17-piece kit also includes a convenient storage case to keep things organized. Never before have pops been so much fun or easy to make. 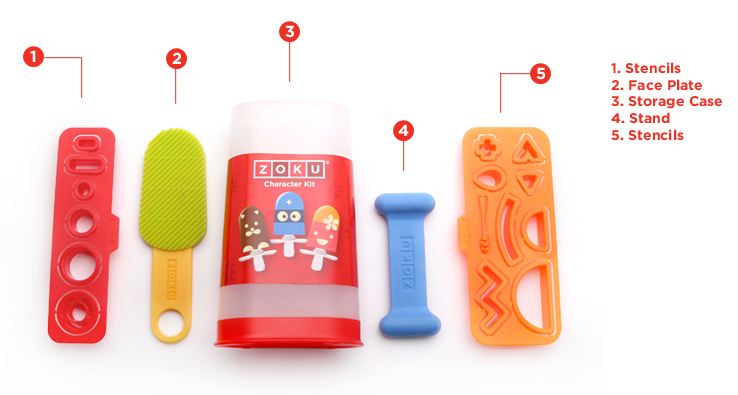 Bring your Quick Pops to life with the Zoku Character Kit! Dimensions: 3.5" x 2.25" x 6"
Works with the original Zoku, the Zoku Duo, and Zoku Single.